If you know me, then you know that I am not that big on manga or graphic novels as I should be. or at least that is what my friends have told me. So I decided to take a chance with this collection. It seemed to not be that long, it had that contemporary feel too it, but what I wasn't ready for was the rawness that it brings with every word but more importantly with every image. 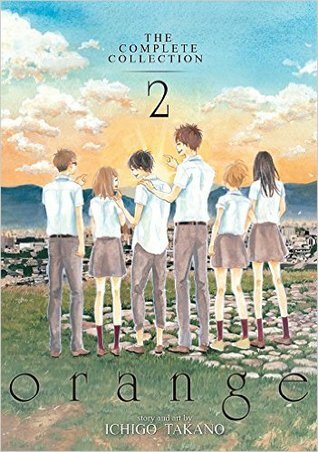 Continuing from where we left off in the story with Naho and her friends working together to save the new kid in class, Kakeru from taking his life. Well that is what they have been told he would do from letters they have received from their future selfs. Now I know you are wondering, I thought this was contemporary, it is but in a different light. Ichigo and Amber brilliantly convey the emotions of these six teenagers as they face their inner turmoils, their friendship, there overall time together. The emotions were there with every word and by the end I had tears streaming down my face but they were not tears of sadness but tears of happiness. Was this a good decision to read this? Yes! Am I interested in reading more manga? Yes! Should you all read this? Most definitely! Orange, for me, has been an adventure that I am lucky to have taken. I feel like I have six new friends for me in my life and they are friends I will never forget.